Spacious with triple exposures facing north, west and south, this half-floor corner split three bedroom, three bathroom residence designed by Champaulimaud offers gorgeous views of the Manhattan skyline and iconic landmarks such as the Chrysler Building through 10' floor-to-ceiling windows. White oak flooring throughout leads from the entry foyer into an open living and dining concept, complete with a chef's kitchen offering honed Capri marble countertops, backsplash, and a waterfall island with ample room for seating. The kitchen has a refined aesthetic with streamlined custom white oak millwork that seamlessly integrates a full Gaggenau appliance package, including an undercounter wine refrigerator, complemented by Dornbracht fixtures. The southern and western facing corner master bedroom with open views, walk-in closet, and separate coat closet features an en-suite windowed master bath. The five-fixture master bath offers Bianco Dolomiti radiant heated flooring underfoot, an enclosed shower, and a Victoria + Albert free-standing tub. A custom double vanity with white oak, rift-cut wood veneer millwork, and Marno Illusion countertops is completed with a built-in medicine cabinet, Kallista Sink and Dornbracht Fixtures. Privacy is ensured with the second and third bedrooms on the opposite side of the residence, one of which features its own en-suite bath with Bianco Dolomiti floors complemented by Fume Bianco marble walls. A custom vanity boasts serene off-white lacquer finish cabinetry with a Fume Bianco marble countertop, accented by Dornbracht fixtures and a Kohler sink. A Nest Learning Thermostat and Bosch washer and dryer complete this elegant residence.The grand amenities spaces are personalized with handmade artwork, distinctive marbles, natural stones, and dramatic light fixtures that come together to create an ethereal, intimate feel. Residents arrive to The Centrale through a sheltered porte-cochere or the private residential lobby, which are both attended to 24 hours a day. The formal Great Room, Private Dining Room with Catering Kitchen, the Club Room, and an all-season Club Terrace are perfect for entertaining in any style. A state-of-the-art fitness center overlooks a 75' lap pool, while the yoga room offers a serene respite. 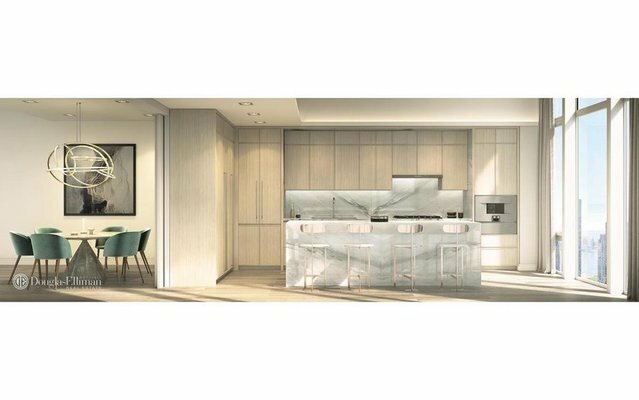 At 71 stories, The Centrale takes its place alongside Midtown Manhattan's most iconic buildings, encompassing a collection of 124 classic yet undeniably modern residences, envisioned by Champalimaud Design. The Centrale's exterior design by Pelli Clarke Pelli Architects, builds upon classic Art Deco architecture with contemporary elements thoughtfully displayed throughout, including the lightly reflective glass façade articulated with facets of terracotta chevrons. The Centrale reveals its base, body and crown from street to the sky with crystalline switchbacks, creating a dynamic rhythm of angled reflections of the surrounding Midtown landscape.